Opposites attract, right? Chandler Brooks is dating Jamie Jason. Yes, that’s right. The most polarizing cast member on Below Deck this season is in a relationship with the least confrontational character from Below Deck Mediterranean last season. She didn’t have one storyline last season other than getting a cold and missing some shifts to rest. In contrast, Chandler is bothering everyone on Below Deck. Other than the obvious Bravolebrity connection and their experiences on luxury yachts, this just seems like something out of left field. However, Jamie has been dropping plenty of hints about the relationship. 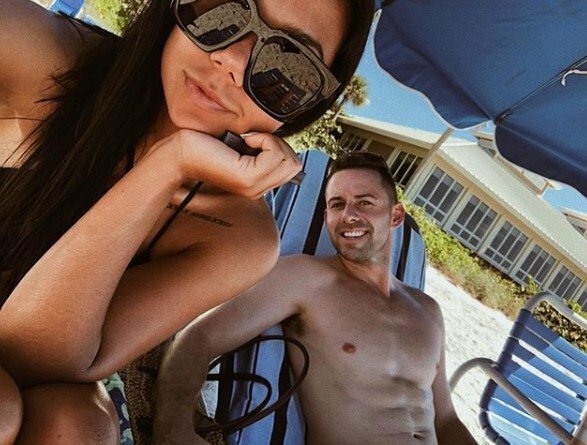 She took things up a notch by posting a photo of her and Chandler on the beach in Naples, Florida. Jamie wrote, “We both like turtles and sharp cheddar cheese” in the caption. Maybe she just isn’t watching Below Deck this year. That would explain a lot. A fan tweeted, “I wonder what @JamieLynnJason thinks watching her BF bosun Chandler treat a female deckhand like such garbage, esp when she was one.. #BelowDeck.” Jamie countered with, “He treats me like a queen.” Hopefully, he hasn’t dropped her on the ground yet. One Below Deck viewer admitted, “I can’t believe ur with him. Y’all seem totally opposite.” Jamie responded with “Good old saying opposites attract.” Apparently so. TELL US- ARE YOU SURPRISED THAT THESE BELOW DECK CAST MEMBERS ARE DATING? DO YOU THINK THEIR RELATIONSHIP WILL LAST?